Preheat oven to 400˚ and bring a pot of water to a boil. Slice potatoes in half and place in boiling water. Parboil until potatoes are just tender, 5-6 minutes. Place in a roasting pan and toss with olive oil, smoked paprika, garlic powder, and sea salt. 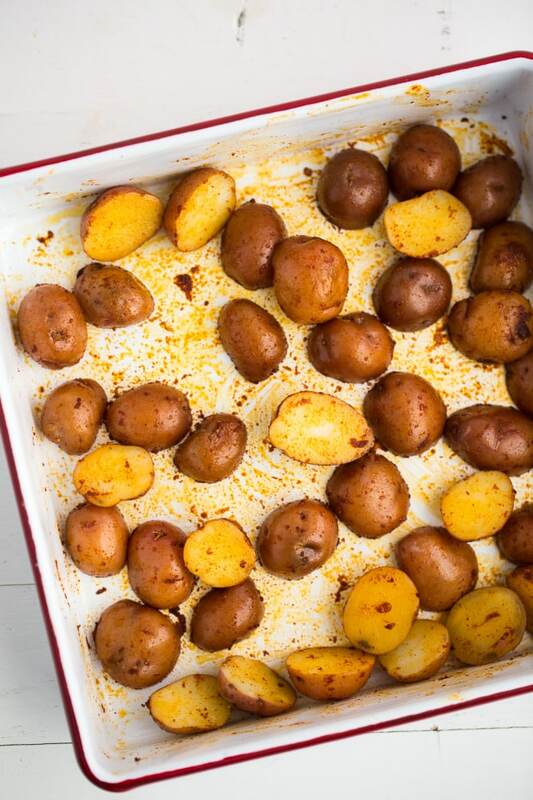 Roast potatoes until lightly browning, 20-25 minutes. Remove from oven and let cool slightly. Trim 1/2″ from the bottom of the endives. 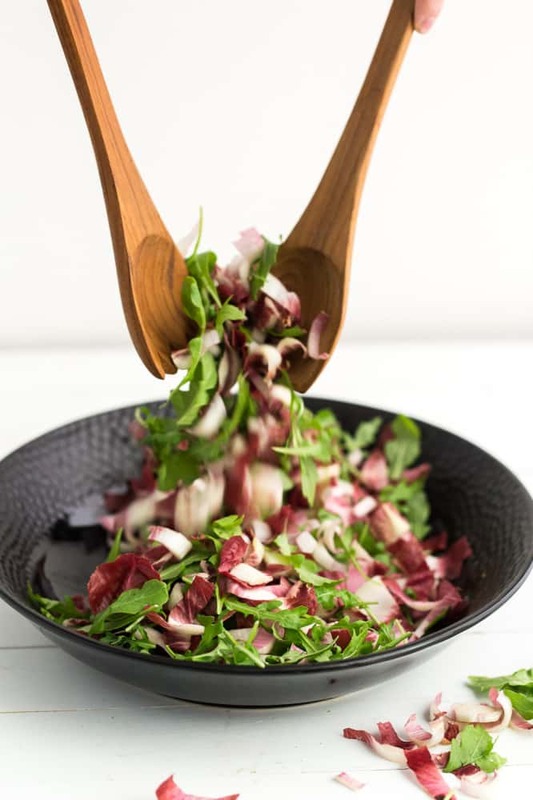 Chop endives into 1/4″ slices and place in a large bowl. Add arugula, quinoa, almonds, and cheese. Add potatoes and toss until combined. In a small jar with a lid, combine ingredients for the dressing and shake until well combined. When ready to serve salad, pour over and toss once more. This post was sponsored by California Endive. All thoughts and opinions are my own. Arugula salads are usually boring, but yours definitely isn’t! The potato, endive, and cheese sound like an awesome combination. 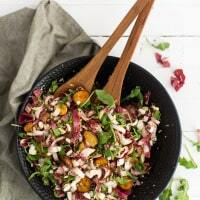 I have a habit of adding arugula to everything, so this salad looks incredible to me! Love the paprika potatoes. I’m right there with you – I love the tangy cheeses and earthy winter squash and bright pomegranate arils that grace fall salads. The sturdier greens and more robust dressings. Roasted potatoes in salad?! Genius. I adore them in a Niçoise but rarely throw them into other salads. That’s about to change! 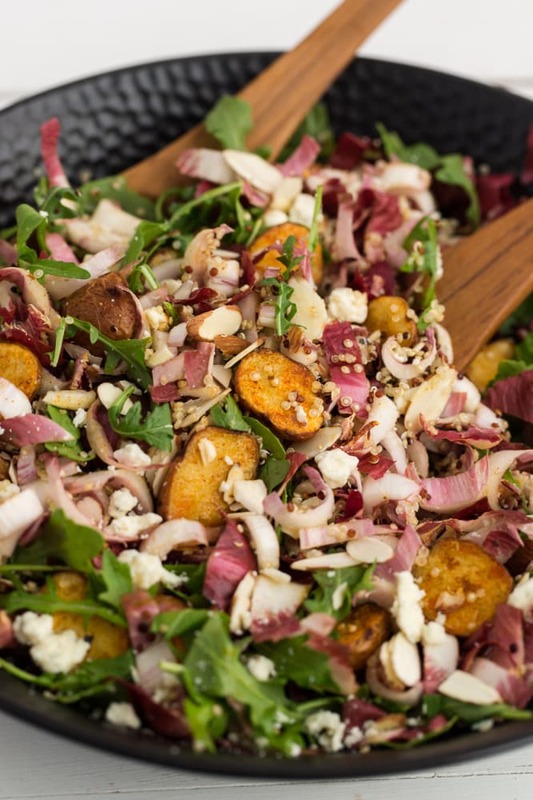 I agree – I love “earthy” fall salads. This combo is exactly what I like to chomp into. I love fall salads, too! Love the colours and textures in this salad, and I’m such a huge fan of smoked paprika! One of my favorite things to make for dinner during the fall/winter months are big salads loaded with root vegetables and a little protein (egg, fish) and dress it with a light vinaigrette. 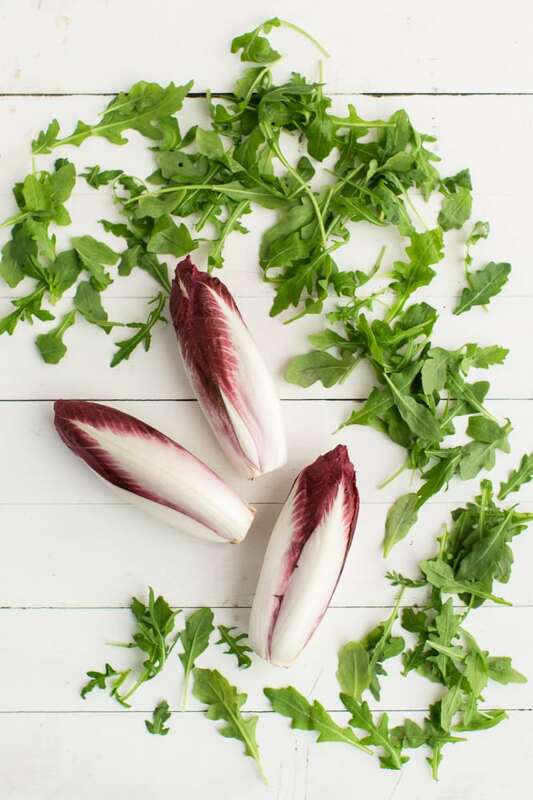 Can’t wait to give your beautiful version with endive and arugula a try! 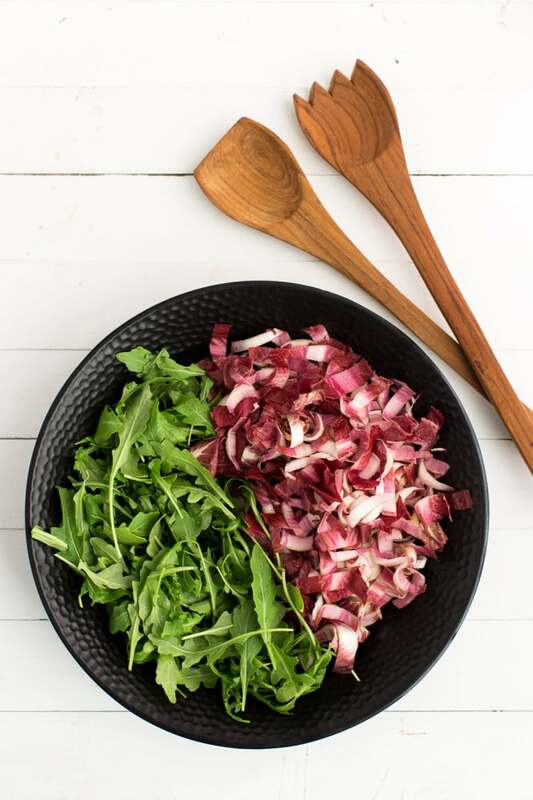 The simplicity of this fall salad is making me excited to pick up some endives at the market! It sounds simply delicious. Made this last night, so so good. Had to use walnuts instead of pecans and Blue instead of Gorgonzola. Spice on potatoes and the dressing are what make the salad! I adore this salad. We use whole wheat Israeli couscous instead of quinoa, and sometimes just make the potatoes by themselves as a side dish. This salad is divine, thank you for the recipe!! 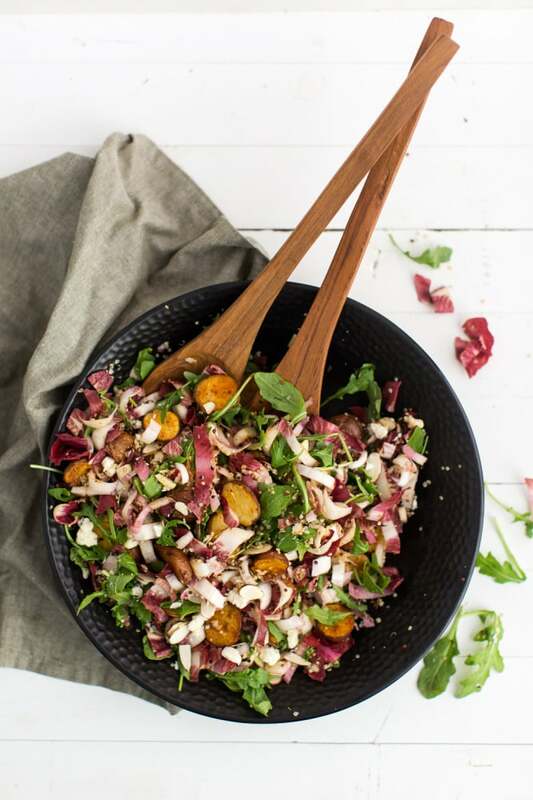 I have had a head of radicchio from my CSA in my fridge for like a month now and haven’t found any recipes that excite me to use it (yes, I realize this recipe does not call for radicchio) until I saw this salad! I (clearly) subbed radicchio for the endives, subbed avocado for the cheese (cuz I’m vegan and plus, avocado is delicious), and used yellow wax potatoes cuz that’s what I had. I also did not boil the potatoes, I just sliced them about 1/4″ thick and roasted for 30 minutes, flipping halfway through. So, so good. I just devoured half the salad for dinner. Thanks so much Erin!